At Precision Environmental Company, we use our financial resources to put us in a position that ensures long-term stability and profitable growth. We have a long tradition at Precision Environmental of valuing relationships with our key partners. Since 1987, we have primarily banked with National City Corporation, now PNC, and utilized the law practices of Calfee, Halter & Griswold LLP and Frantz Ward LLP for legal guidance. We have never had a lawsuit involving any client nor subcontractor for disputed work activities, construction claims or scheduling impacts. We pride ourselves on communicating and the agreement of the work scope before the project begins. Our unique insurance requirements have been guided by Paul Brickenden since our first day in business. Now his team at The Evarts-Tremaine-Flicker Company , working with Oswald Companies and The Fedeli Group and Zurich American Insurance Company, an A+ rated carrier, provide the most comprehensive liability coverage available to the industry. Our broad range of coverage includes General Liability, Contractor's Pollution and Professional Liability as well as transportation of materials, and protection should mitigation be needed at a disposal site. Extraordinarily, we can obtain greater policy limits upon request protecting our activities truly from "Cradle to Grave". Our bonding partnerships have been managed by Jackson, Dieken and Associates provided by Great American Insurance Company , an A+ rated carrier, for over 20 years. Our relationships have provided over $185 million performance bonding to our clients. We have bid specific projects including bonding as large as $30 million. Our financial statements have been audited or reviewed since 2005 by Ciuni & Panichi. We have also engaged regional firms Skoda Minotti and Cohen & Company for advisory services. These firms add expertise to our Company in meaningful ways. Further information is available on request. Precision Environmental participates in Ohio Bureau of Workers' Compensation Group Retrospective Rating Program. The application process includes providing evidence of stringent safety record standards and demonstrating financial strength and stability. The overall success of the program is only achieved in conjunction with a company core focus on safety, and a dedicated team working to control the costs associated with workers' compensation. This includes the implementation of a sound program that utilizes a combination of internal procedures when a claim occurs with proactive claims management, aggressive transitional return to work and cost containment strategies. 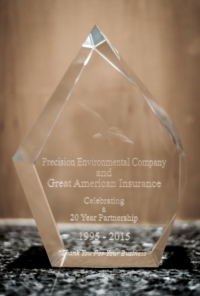 "I am pleased to read about Precision Environmental's 20th Anniversary. I congratulate all of our friends at Precision Environmental on achieving this significant milestone. We are proud to be the bonding company for Precision. We look forward to continuing our mutually beneficial relationship for many years to come."